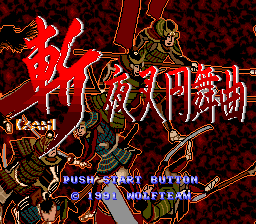 Zan Yasha Enbukyoku (斬 夜叉円舞曲) is a 1990 strategy game for the X68000 by Wolf Team in their Zan series of strategy games. They ported it to the Sega Mega Drive in 1991. No version has left Japan. Main article: Zan Yasha Enbukyoku/Magazine articles.